(Marblehead, MA)- The annual Storm Trysail Club Ted Hood Regatta took place from August 24th to 26th for fleets of J/70s, J/105s, and a variety of ORR-EZ/ PHRF handicap racing teams. 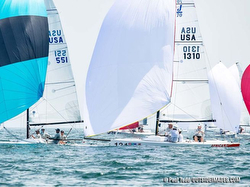 The regatta was significant for the forty-seven J/70s since was the last major event prior to the upcoming 2018 J/70 World Championship being hosted by Eastern YC in late September. What was remarkable about the regatta for the J/70 class was the fact that every team in the top five had at least one or two double-digit finishes, which is how tough the fleet was over the three days. Winning was Tim Healy’s NEW ENGLAND ROPES with a 5-11-2-6-3-3-4 tally for 34 pts, handily winning the event. Second was Brian Keane’s SAVASANA, the only boat to win two races, with a record of 1-22-4-5-5-1-8 for 46 pts. Then, third was Umberto de Luca’s Italian crew on MASCALZONE LATINO with a scoreline of 10-3-15-1-2-7-10 for 48 pts. Winning the Corinthians Division was Jim Cunningham’s LIFTED from San Francisco, CA. The J/105s enjoyed good racing off the east of Children’s Island. Winning that fleet with four bullets in their scoreline was Mark Masur’s Texan team on TWO FEATHERS. Second, was Ken Bowden’s KNOTLESS and third was Jon Samel’s BLOWN AWAY. In the ORR-EZ Division 1, Gary Weisberg’s J/111 HEAT WAVE took third, followed by Fred de Napoli’s J/124 ALLEGRO MALVAGIO in 4th, Tom Mager’s J/122 GIGI in 5th, Chris Lund’s J/133 JUMP in 6th, and Ed Kaye’s J/111 PRAVDA in 7th.